Promises? The word itself is tainted. Just think of every New Year’s Day you’ve ever had and count the number of resolutions that remain unbroken on one hand. It’s a silly, impractical word of flighty gravity, a weapon wielded by wily kids and desperate, deluded lovers. So when you wait until your fourth album in fourteen years to make one of these, the cards are stacked against you. Yet here we are, in 2013, with English indie-rock band The Boxer Rebellion’s latest: Promises. Oddly enough, though, the band doesn’t fight the connotations of that cursed title. If anything, it embraces them, blurring the lines between the murky emotional tones of its previous work and a previously unseen sunny side—showing that world-weariness and optimism aren’t necessarily mutually exclusive philosophies. 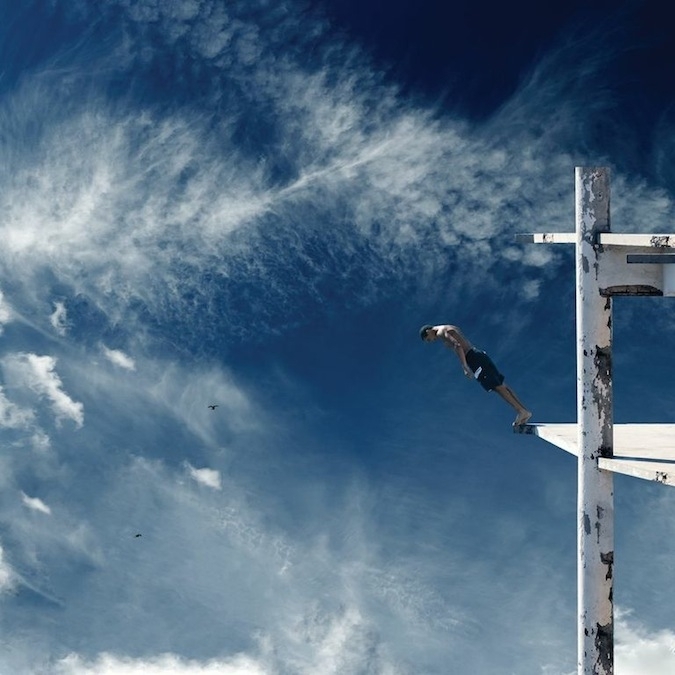 The blue skies on the cover need no words to embellish their significance: Promises is The Boxer Rebellion at its brightest, and paradoxically, that attribute also makes it the band’s most mature statement to date. In a way, the band may be back to its roots, crafting cathartic indie-rock ruminations by way of Explosions In The Sky, but on Promises, it’s also branching out in new directions, taking notes from the new indie canon and integrating them into its core. In fact, it wastes no time in shaking up the formula: “Diamonds” pounds out of the gate with a rock-solid drumbeat straight out of a 60s prom. The elements of the song should be familiar to long-time fans of the band—dreamy synth pads, vocalist Nathan Nicholson’s weighty baritone, and seductive little licks of guitar hanging on the periphery—but the arrangement is somehow more assured, more defined. Gone are the hazy sketches that composed much of The Cold Still: the sound on Promises is minimalist but hefty, practically an exercise in musical functionalism. Equally effective are the lyrics, barren and frank even for a band that’s been nothing but barren and frank. Yet there’s emotional release in all of this reservation: even as Nicholson dives into themes of helplessness and resignation, the song only grows buzzier and buzzier until it sends the guitar soaring over the top at the end in a powerful moment of release. “Always” offers a similar sense of catharsis: “Let it out, let it out,” commands Nicholson just before launching into one of the band’s most openly sentimental choruses to date. Though earlier releases were aesthetically gorgeous but often distancing, The Boxer Rebellion hits a raw emotional vein on Promises, and both the brutally honest simplicity of the lyrics and the changes in the band’s sound reflect this evolution. Not that it’s all storm clouds and guitar thunder, though: certain cuts on this album could make a legitimate case for The Boxer Rebellion as a future chart topper. While the rhythms on albums of past have largely been subtle, relegated to atmospherics, the band finds a surprising kinship with dance rhythms on album number four. The dreamy, uplifting “Fragile” is surprisingly powerful, with its four-on-the-floor beat, jangly guitar lines, and toms that gradually twist into more dynamic rhythms. Perhaps the album’s best overture, the bubbly “Take Me Back” features a masterful build-up as the beat moves from being a background fixture to being the center of the song, reaching a technical and emotional high not unlike what post-rock innovators 65daysofstatic achieved with dance-rock experiment We Were Exploding Anyway. The juxtaposition of subdued emotional subtext and seductive sonic force is one The Boxer Rebellion puts to good use on Promises, finding a way to turn fundamental human experiences into opportunities for transcendence. What’s most surprising about Promises, however, is how nakedly romantic it is. Impassioned appeals like “Take Me Back” are some of the most personal the band’s ever done, the aura of youthful abandon all the more surprising coming four albums in. The result of this belated blooming, however, is that the band gets to have its cake and eat it too: it’s as if the band is reaching into the summer nights of its past only to refilter them through the lens of the spiritual winter it’s making its way out of. Of course, the approach isn’t without its faults. “New York” offers a compelling sense of loneliness in its quietest (and its most effective) moments, but the grandly misplaced drums overpower what could have potentially been a moment of profound connection into yet another emotional flourish, an Instagram snapshot of a conversation that meant way more when it was just the two of us. “You Belong To Me” is a far more interesting deviation, however, using a swing tempo that rises and falls like a pulse and dialing back the instrumentation to create an intimate space for hearts to swoon freely. Coming from a band that usually couches its sentiments in cryptic statements and perpetually reserved instrumentation, the unabashed romance means even more. This late into the band’s career, it’s been earned. All of these subtle evolutions in the band’s character culminate in one of the best songs it’s written to date. “Safe House” may be hidden in the middle of the album, but it captures the essence of Promises beautifully: the image of indifference Nicholson sings of wanting “to stamp out”—and the possibility that maybe we can stamp it out after all. “So follow me, help me out, I have no guarantees but the shade of the safe house,” he sings in the chorus, and the instrumentation, up to then reflective and almost wistful, rises out of its moping and into the realm of triumph. Amiable as the song may be, it’s in its own way a defiant declaration, an ode to hope—a spark that shines even brighter set against the backdrop of darkness in which it is awakened. And to the band’s credit, it finds truth in that paradox, shading crayon-scrawled abstractions in with the humanity and honesty lent by experience. It’s not easy finding something to say when you’re in fourteen years deep. Things have inevitably changed, rarely for the better, often for the worse. That glow on her face will fade. Her lovable quirks will become loathsome vices. You will be tangled in debt and disease and doubt, all of those fixtures of what it means to be an adult, a grown-up living in a grown-up world. No longer are your vows sacred but just words, promises you only made to break. And in our world, what other kind of promise is there? If there’s any band that can identify with these feelings, it’s The Boxer Rebellion. In its fourteen years, it’s lived through them. But on Promises, they make one that not even time can erode: we can make it through. Change is inevitable but growth is optional. And I will grow, make no mistake. I will become better. This heart may be bruised, but it’s still beating. And I just wrote you eleven songs to prove it. The last two paragraphs are beautiful. Loved this review.